Basement Remodel – A smartly finished basement is sure to impress guests and buyers alike. Make sure that the job is done right and hire an experienced professional contractor. Bathroom Remodel – Nothing scares people off like an ugly, outdated bathroom. Modernize it with new fixtures, tiles and flooring. Kitchen Update – The kitchen is the most important room in the home. It is where home-buyers direct most of their attention. 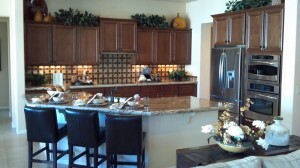 Bring it up to date with new countertops, hardware, flooring and appliances. Exterior Remodeling – Add instant curb appeal with brand new energy efficient windows and maintenance free siding. Garage Remodel – New garage doors, organized storage and custom flooring will make your garage stand out. Finish Attic Space – Transform an underutilized storage space into a chic, additional bedroom. Add a bathroom for more value and convenience. Custom Deck – Minneapolis is a beautiful city. Buyers will love to spend time outdoors on a gorgeous new custom deck. Bannochie Builders, Inc. is a leader in value adding, professional remodeling services. We are Licensed Remodeling Contractors who have been renovating Minneapolis, MN homes since 1995. Contact us today for a Free Estimate on home additions and remodels. This entry was posted	on Saturday, December 27th, 2014 at 6:08 pm	and is filed under Home Remodeling. You can follow any responses to this entry through the RSS 2.0 feed. You can leave a response, or trackback from your own site.